In the case of a novel, some authors are playwrights, and prefer to write their own script directly. They can do this because ever since the 14th century in western culture, they learned at school how to read and write speech. The script can provide a source of the work for posterity, which how we still have the great works of the past such as Shakespeare's plays. The difference with dance is that sadly, few choreographers have learned a notation, so many choregraphers who then often also act as the dance coach, leave no written record of their work for posterity. Over the last 50 years, this sad situation has been changing with the advent of recording with film and video. However, film and video have four problems in trying to use them to re-create a dance. The first problem is the scale of movement. If a film is wide-angle enough to show the whole of some dance across a stage or dance-floor, it will usually not have enough definition to show details, such as hand or head movement. The second problem is obscurations. Parts of figures will at times obscure vision of what other parts and figures are doing. This can be rectified by deliberately filming from two different directions, such as from the front and from the side at the same time, but this is starting to add complication to an otherwise simple idea. The third problem is psychological, and it adds yet another complication. We are too used to interpreting movements of ourselves in mirrors. If a film of a lady dancing is taken from the front, when she moves say her left arm and turns to the left, another lady observing and trying to copy it, is inclined move her right arm and turn to the right. If a film is to be taken as a record of the dance rather than just to watch the dance, it should be not be taken from the front, but should be taken so that a movement to the left appears to be a movement to the left, so it should be taken from behind. This means that for entertaining people who just wish to watch the dance: such films are no use. So the main financial incentive for making films of dance does not apply to such films, and they are seldom made. But even making such special films does not solve the fourth problem, which is more philosophical. This is the distinction between prescription and description. Taking a film of what someone does is only an aid to understanding what they were trying to do at best . This is the main reason for using notation rather than film/video. The notator is not hampered by such limitations as gravity, friction, and the skills of the dancers. Notation is uniquely able to record what a choregrapher wants the dancers to do, rather than what they can do. There are names for the parts of the body and the directions of space, so why not use verbal descriptions for dances? The problem is the complexity of the human body. We each have about 200 joints, some of which can move very little, but some of which may be moved and twisted in the three dimensions of space. The description in detail of a dance like the Merrilyn, which has about 45 steps in it, requires about four pages of text (Hesketh, 1989, Boyd, 2005). Most dancers find such text, even when conveniently tabulated, amazingly difficult to read and understand. It typically takes a year of guided reading of these texts to learn and understand the descriptions of the 15 Championship New Vogue dances. Labanotation is a human movement script widely taught and used around the world (Hutchinson, 1970). It can be used to show a series of human movements to an arbitrary level of detail. The notation uses a staff of three lines which run from the bottom to the top of the page, Symbols are placed beside these lines representing an overhead view of a figure and its movements as time progresses up the staff. 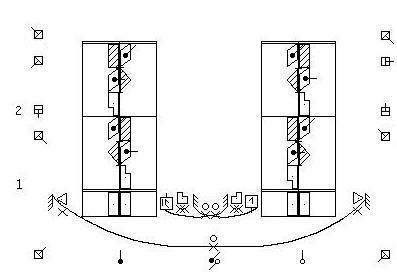 Across the staff lines are placed numbered bar lines at regular intervals, representing the bars of the music, and the beats of each bar are represented as ticks on the centre staff line. The symbols are extended or contracted to cover the time period of the movement, so the symbols for the first two movements (slows) are twice as long as the symbols for the third and fourth movments (quicks). The dot in the middle of the above symbols represents middle level: not especially high or low. Alternatives to this are to hash the symbol, meaning it is high, or to fill the symbol in, meaning it is low. Figure 2 shows the side and closing steps on the toes in Forward Changes of the Waltz. A turn on a foot is indicated by a parallelogram symbol, which points either to left or to right depending on the direction of the turn. An example is shown in figure 3, of the man's steps in a Waltz Natural Turn. The amount of turn is indicated by superimposing a pin over the turn symbol. The angle of the pin relative to it pointing up the page shows the amount of turn, typically in units of 1/8 of a complete rotation (45o). Thus figure 4 shows the same as figure 3, with a 1/4 of a turn between steps 1 and 2, and 1/8 between 2 and 3, etc. Man's steps in a Waltz Natural Turn with amounts of turn specified. Because the turn happens on the standing foot while the moving foot is taking its step, the turn symbol can also be placed beside the symbol for the step concerned, as in figure 5. Alternative notation of the Man's steps in a Waltz Natural Turn. Symbols placed inside the outer staff lines indicate gestures of the legs, such as aerials, brushes, and contact with the floor without weight. These symbols will always be filled in black (low level) as the legs in these New Vogue dances are never lifted to, or above, the hips where they are joined to the body. A tick beside the symbol indicates contact with the floor without weight. Chassé to the left, leaving right leg at the side touching the ground. So in figure 6 is shown a chassé ending in the free leg being held at the side in contact with the floor. The small circles show that the preceding foot position is held in each case. Symbols showing the placing and movements of the arms are positioned outside the staff. So figure 7 shows the man with left arm to the side, and the right arm forward. The 'x' symbol under the left arm sign indicates that it is somewhat bent. The 'double x' symbol under the right arm shows that it is contracted. A variety of signs and symbols are used to indicate various other significant parts of the body. A selection of these are shown in figure 8.
upper surface of the right upper arm, front of the right hip, right hand. If two people are dancing together, in synchrony with each other, two staves are used, one for each partner. For ballroom dancing, the man's staff is indicated by a filled pin below it, and the lady's by an empty pin below it, as in figure 9. Man and lady in position to take normal ballroom hold. The pair of pins under the centre of the double staff indicates the starting alignments, with the man facing LOD, the lady backing LOD, and that she is close in front of her partner, but offset slightly to his left. When one part of a body touches another part of the same or a different body, this can be indicated in Labanotation by a curved contact bow. The bow is placed so that its two tips are each on a symbol, one for each of the two body parts that touch. As an example: figure 10 shows normal ballroom hold. Man and lady in position in normal ballroom hold. the man's right hand holds the lady's left shoulder blade. All the contact bows for this position have an 'x' on them somewhere to show that each hand is holding, rather than just touching its contact. There is also a small circle above each of these holding signs showing that the contact is continued until a sign is given that it is released. The 'release' symbol is a broken circle symbol: two semi-circles slightly displaced. Simple notation of the Waltz Natural Turn. Further Labanotation signs and symbols could be added to this to show more details. For example, I have notated only three of the five contacts of closed ballroom hold, leaving the other two to be assumed as a consequence of the three that are notated. Further details could be added such as the delayed turning of the inside partner, the gradual rise and fall, the swing, the sway and the CBM. However, this simple form already gives a description of the Waltz Natural Turn to the same precision as is given in many verbal scripts of sequence dances. Labanotation has a over a thousand signs and symbols which can be used to describe movement to an arbitrary degree of precision. Luckily, to describe a sequence dance in notation in just enough detail so that a person reading the script can perform the dance, only a small subset of these symbols need to be used. There is a problem that notation has in common the verbal descriptions. This is the problem of errors. Dance scripts have to be written by a person. People make mistakes. The industry standard is that one thing in every ten things we humans try and do has an error. This is an average. Some people are naturally more accurate than this. Sadly some people are worse. So speaking generally, if we type ten characters, we might expect one character to be wrong. Normally we would spot such an error straight away and fix it straight away. But of course one in every ten fixes will, on average in general, be in error. So after this immediate editing, one in a hundred typed characters will likely end up being wrong. Getting someone other that the original writer to read the result will spot most of these unfixed errors, but of course there will still be one in ten of these left. This is why some big computer programs, such as Windows, composed of millions of lines of code, will always have errors in them. People make errors trying to spot errors. So it is standard practice with dance notation to get another notator to read a newly written dance script to seek errors. A rather better way of spotting such errors is available to notation written on computer, which is not available to scripts written as verbal descriptions. The computer file of the notation script can be used to make an animated figure perform the dance. Some errors are then very obvious in such animations. When a figure moves the wrong limb or turns the wrong way, it is easy to go to the notation and correct it. In notating a 16 and 32 bar sequence dance, with maybe 100 steps, we might expect 1 in every 10 of these steps, i.e. 10 steps, to be wrongly written in the first draft. But with initial corrections, 9 of the these 10 can be expected to be fixed, leaving maybe 1 error in the corrected draft. Hopefully when that has been proofread or animated by computer one more time, the notation is likely to be accurate. It is sad that only writing (speech notaton), and music notation are taught in many schools. Movement notations such as Labanotation are hardly known outside the worlds of ballet and folk dancing. But dance is just as much a part of our human culture and heritage as drama and music. It is good that with the gradual spread of the use of Labanotation, our dance heritage can now be written for future generations to access. 165 Bobbin Head Road, Turramurra, NSW 2074, Australia. Clayton Dance Centre, 296 Spring Road, Dingley, Victoria 3172, Australia. Theatre Arts Books, New York.